3D Training Institute is launching a monthly webinar series featuring prominent studio recruiters who will describe the exciting career opportunities for 3D artists and how to land a dream job in 3D! By connecting tomorrow’s creative leaders with design leaders and equipping them with the professional tools to bring their ideas to life, we can expose youth to rewarding career possibilities around their design interests. 3D Training Institute (3DTi) is launching a monthly webinar series, featuring studio recruiters who will describe the exciting career opportunities for 3D artists. These webinars are a unique opportunity for students who want to work in movies, video games, or architecture to talk to the people who make hiring decisions. 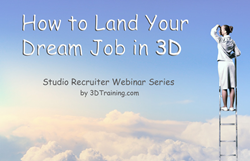 Each webinar will feature a recruiter from a well-known studio. They will describe their jobs for 3D artists, salary ranges, and job requirements. The recruiters will share job opportunities and tips for getting hired. The webinar will also feature a successful artist who will describe his or her journey to success, and answer questions. Webinar participants—high-school and college students and teachers—will be offered a free introductory training program from 3D Training Institute so that they can take the first steps towards their 3D career right away. Students and educators can also take advantage of free access to Autodesk 3D design software via the Autodesk Education Community – these are the same design tools used by design professionals and commercial studios worldwide. Computer hardware discounts will be offered, and at some of the webinars, there will be contests for beginners and advanced 3D users. Winners will have their reel/portfolio reviewed by a studio recruiter. Connecting students with studios is 3DTi’s latest step towards helping students achieve a rewarding 3D career. 3D Training Institute, an Autodesk Authorized Training Center, teaches 3ds Max®, Maya®, Revit®, Inventor®, and AutoCAD®. 3DTi wants to raise awareness about career opportunities in 3D, and help students prepare for and land that dream job. “Young people often aren’t aware of vocational opportunities that align with their passions and skills. By connecting tomorrow’s creative leaders with design leaders and equipping them with the professional tools to bring their ideas to life, we can expose youth to rewarding career possibilities around their design interests,” said Peggy Snyder, Director, Autodesk Education. The webinar series will launch in January of 2015. For more information on how to register, or to find out more about this webinar series, CLICK HERE. Please note: Free Autodesk software and/or cloud-based services may only be used for educational purposes and are subject to acceptance of and compliance with the terms and conditions of the software license agreement or terms of service. Details and restrictions available at http://usa.autodesk.com/legal-notices-trademarks.